Right next door to the hipster, too-cool-for-school Brooklyn area of Williamsburg, is Greenpoint which, in contrast, is known for its rich Polish culture and community. 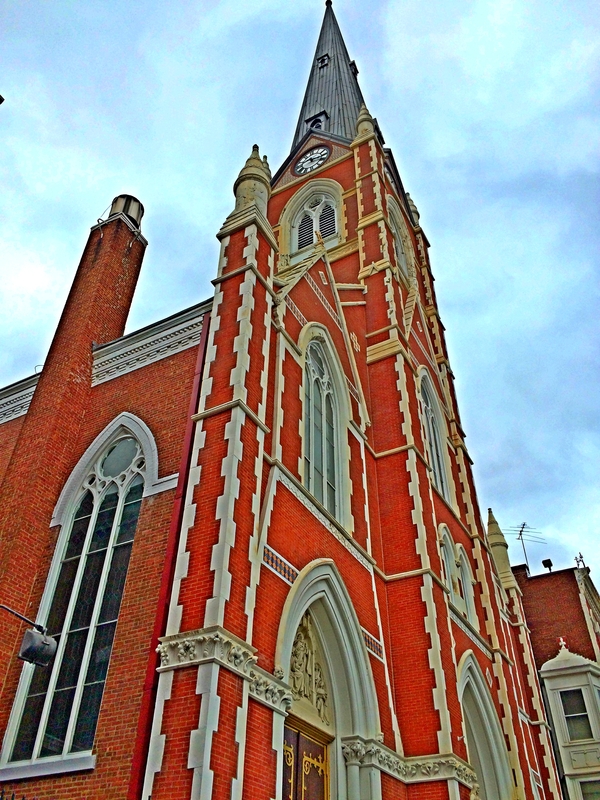 This North Brooklyn neighborhood is home to the second largest concentration of Polish immigrants in the U.S., making it the perfect place to not only buff up on my cultural history, but also find the best pierogi in all of New York! For those that don’t know, pierogi are Eastern European filled dumplings of savory goodness. Luckily for me, one of my best friends is Polish and I’m thrilled to have finally got her to show me all the best meat markets, authentic foods and baked goods this area has to offer! Our first stop was to eat a hearty meal- obviously! 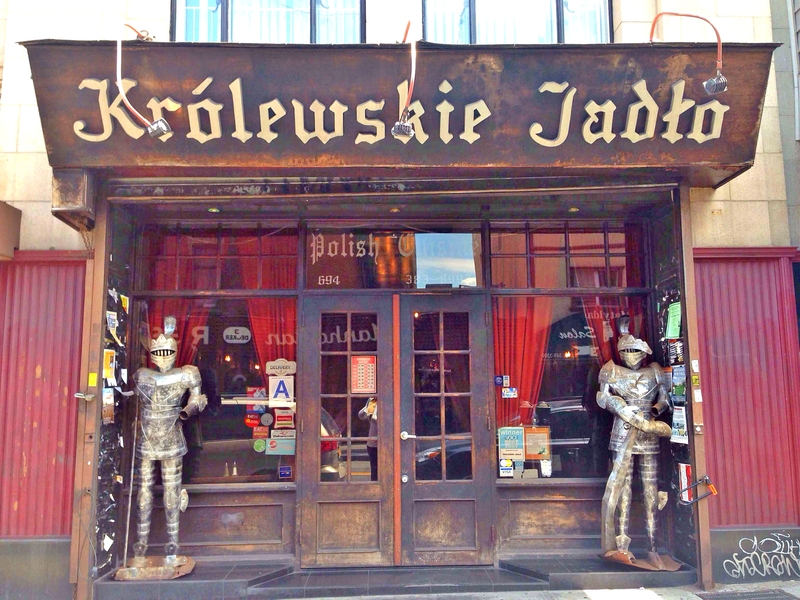 Krolewskie JadloKings Feast—is a medieval-themed restaurant that serves up amazingly good Polish food that will literally have you stuffed before you get anywhere near finishing your plate. This establishment goes full out on the decor, with fully suited armored knights greeting you as you walk through the front doors. Decorating the restaurant inside are paintings of Polish Kings, actual swords and fun medieval accents. The meal started with an adorable wooden cutting board topped with fresh bread, a lard spread- move over butter- and tasty sour cucumber chips. My appetizer was the surprisingly phenomenal White Borscht soup! 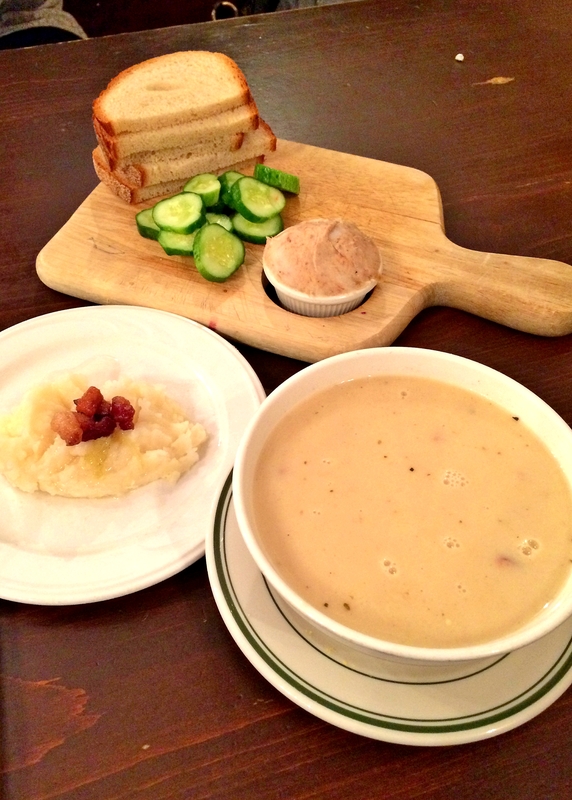 It’s a creamy, smoky soup with pieces of kielbasa and half an egg inside, served with side of mashed potatoes. Who knew I was a borscht kind of girl? 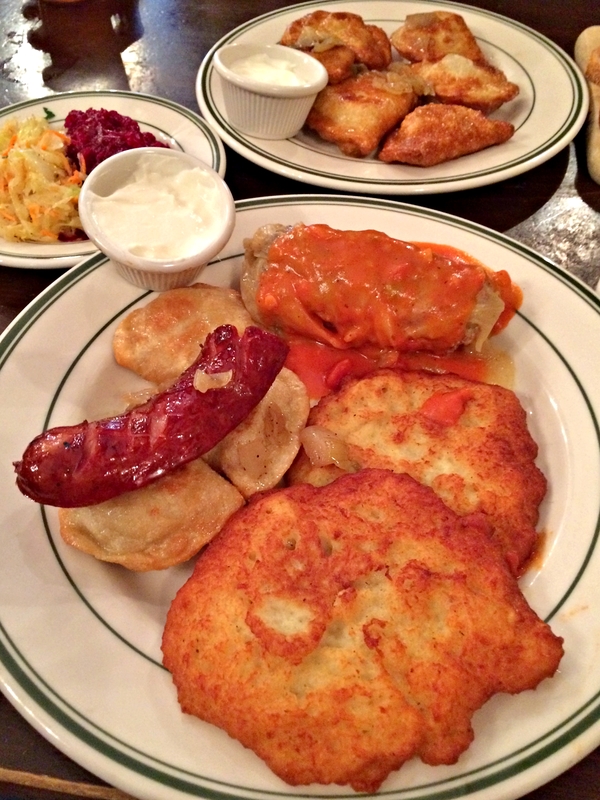 Because I’m indecisive and wanted to try everything, for my main I ordered the Polish Plate which had it all: stuffed cabbage, pierogies, potato pancakes, kielbasa and a couple types of beet and cabbage slaw. It was so so so delicious. Fried, stuffed, crunchy, rich, hearty and smokey… literally everything I love on a plate. After I stuffed myself, we ventured to meat heaven: Polam International Meat Market, where all types of sausage live in smokey splendor. 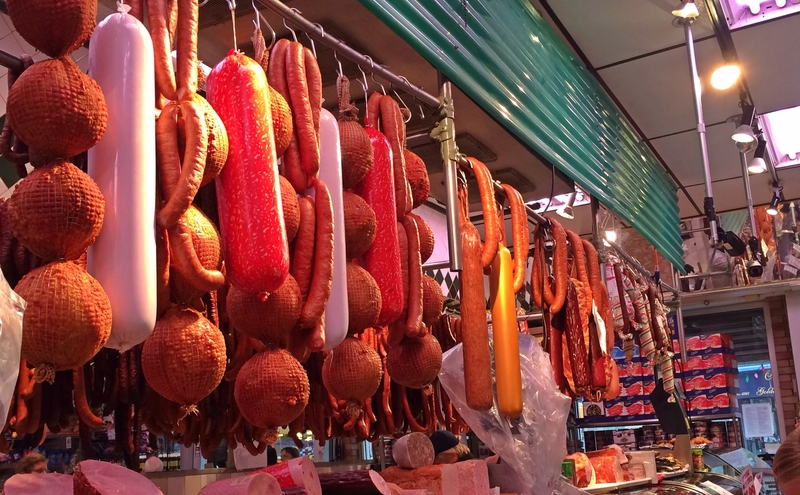 This place has the most variety of meats I’ve ever seen in my life and all the links were just hanging there! Chillin! The whole place has a crazy aroma- imagine being in a room where all the walls were made… of bacon. That’s what it was like. Arguably one of the best experiences of my life. Although it was freezing. We also went to another very authentic meat market afterward that looked like it could have been ran by the Polish mafia. I was a bit uncomfortable. For sweet treats and coffee, we checked out Cafe Riviera which serves up traditional polish pastries including babka (sweet bread) and piernik (gingerbread), cheesecake by the pound, croissants and colorful macaroons. One of the best parts of this trip was all the candy I bought! 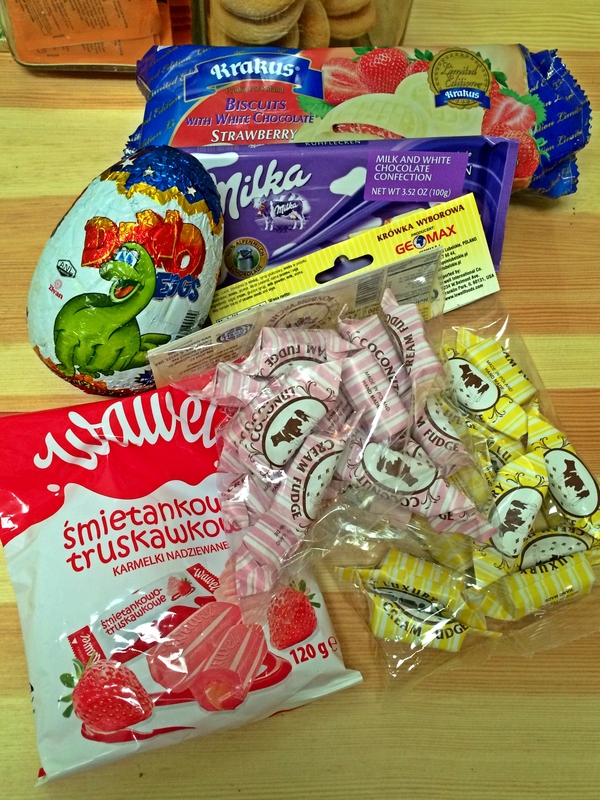 All the polish supermarkets have amazing candy and chocolate selections. One of my favorite candies of all time are the Milky Cream Fudges! Krowki, translated literally as cow candy, are creamy and caramel-like, without the gooeyness. They are super addictive, melt in your mouth and will change your life. I also was very excited about the Dino Egg I purchased. However, I was disappointed, as the “prize” inside was a pencil sharpener- a pencil sharpener! The chocolate was still chocolate though, so it wasn’t a total loss. I also got some strawberry hard candies, strawberry cookies covered in white chocolate and an always fabulous Milka chocolate bar! Yes totally! The food is fantastic and the area is really unique. I’m sure you’d love it! Plus it’s near by a lot of great shopping, the waterfront and a pretty park! Wow! You have to take us there next time, Chey, so many delicious foods.